The new Queen biopic, “Bohemian Rhapsody,” promised to rock you and rock it did. Viewers get an in-depth look at Freddie Mercury’s personal life, as well as the highs and lows of the band. The audience feels as though they were at the concerts and experiencing every emotion along with the legendary rockstars. The movie’s greatest triumph lies in its ability to humanize these god-like figures of rock history. Rami Malek’s depiction of Freddie Mercury captures every unique expression, nuance of the accent and swing of the hips. The actor shines as he fills the big shoes of the world-renowned rockstar. The film focuses on his Zanzibarian heritage as the singer transforms from Farrokh Bulsara to Freddie Mercury over the course of the runtime. We see his rise to fame and struggle with self-identity as he falls in love with a girl, only to fall out of it as he comes to terms with his sexuality. One of the main attractions of the film is the excitement in finally diving into Mercury’s sexual discoveries as one of the most important gay rock icons in history. However, his platonic love for his fiancee Mary overtakes his search for individuality often. Under the glittery outfits and gender-bending makeup, “Bohemian Rhapsody” dives deep into Mercury’s role in the music industry, and how he changed the very culture of rock music. Mercury’s search for who he is took lots of parties, and lots of partners. His battle with AIDS add a melancholia that’s hard to stomach sometimes, but this sadness is supplanted at the end of the film, when the audience learns of his true-love romance that lasted with him until the day he died. 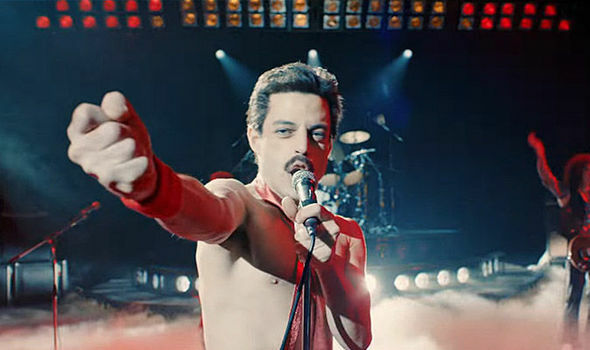 The film greatly succeeds in tracking Queen’s ever changing tone as viewers follow the member’s search for unique and unheard sounds. The scene where Mercury’s vision of the song “Bohemian Rhapsody” unfolds before him proved most poignant. It is followed by a shot of the band’s real music video littered with negative reviews about the song all over the screen. It lends itself to the rebellious spirit the band was so famous for. To capture the journey of a band or a single musician in the span of little over two hours is an impossible task, yet filmmakers continue to do it. It’s because fans crave a humanized version of these people made immortal by fame. We will always want to know more about a person we idolize. We will always be interested in secrecy. As far as “Bohemian Rhapsody” goes, the film celebrates the outstanding qualities of Queen and it felt like the ’70s had returned. This film will assure that Queen’s legacy will live on, long after the spotlight goes out.